This post is sponsored by Sherwin-Williams®. All opinions are my own. Sometimes the idea of a project is so good that I put blinders on to the actual amount of work that needs to go into it to make it happen. This is the story of one of those projects! 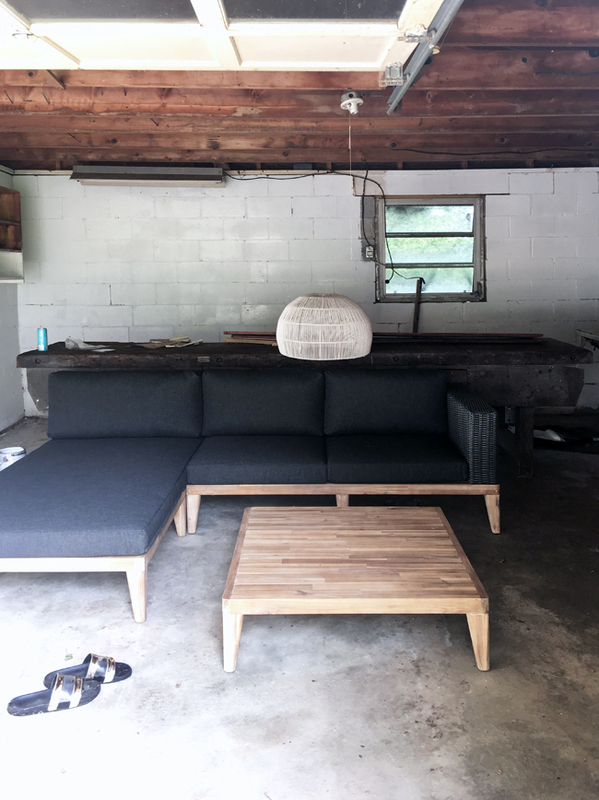 When I first started working on #ProjectFamJam we knew the main house had to be tackled first, but in the back yard sat a cinder block detached garage that had potential. It has sat there, patiently waiting ever since. A diamond in the rough… although as it sat I quickly forgot how correct the term rough was. This was one of those workshops that was most likely built by the original owners and definitely served its purposes as a workshop. The very large wood workbench along the back I am sure had seen its fair share of projects over the years. Fluorescent lights were hung where they were needed out of necessity, not for aesthetics. And large screws and nails were strategically placed, even if now they simply appear to be random. This was the job of this little workshop, until now. You see, since day one the term thrown around for its future end use has been The Party Shack. So my job was to turn this once utilitarian space into a desirable hangout to spend entertaining friends. Again, I had glamorized this space in my head over the past year or so and glazed over the fact that we may or may not have had to get an exterminator out here, the power to this building had been cut years prior and there were layers of dust/pollen/dirt on every surface. Thats what happens when a building sits abandoned and unloved. First to tackle, aside from cleaning… was to address the surfaces in this space that would not be changing. 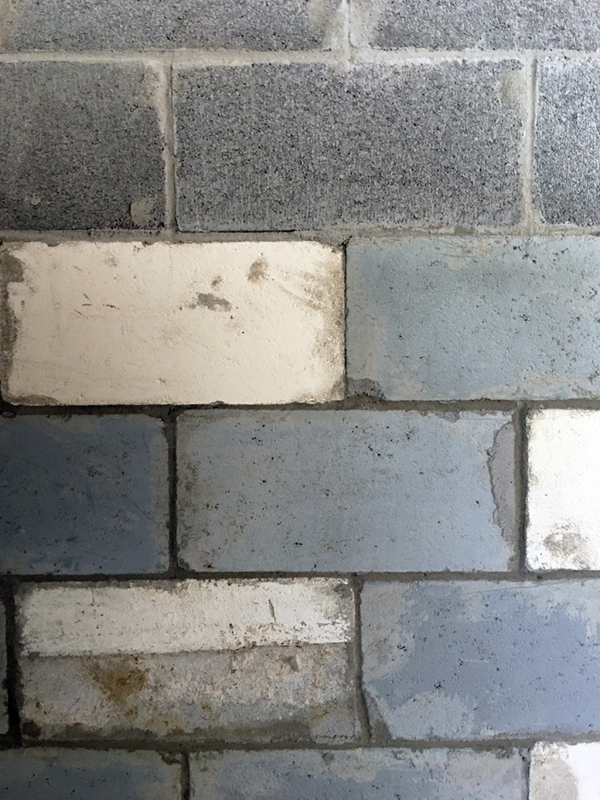 The concrete floor (something I was eager to work with) and the less than desirable CMU (Concrete Masonry Unit) walls. These walls looked as if they have been assembled and reassembled over the years. Patched and repaired as needed. Again, a utilitarian space. I get it! But for my purposes I needed them to look less like a garage. So, in keeping with the rest of their home I decided to make them white. Taking them white would freshen the space and allow the exposed wood rafters and the floor to stand out. Exactly what I wanted. Now to paint them!! 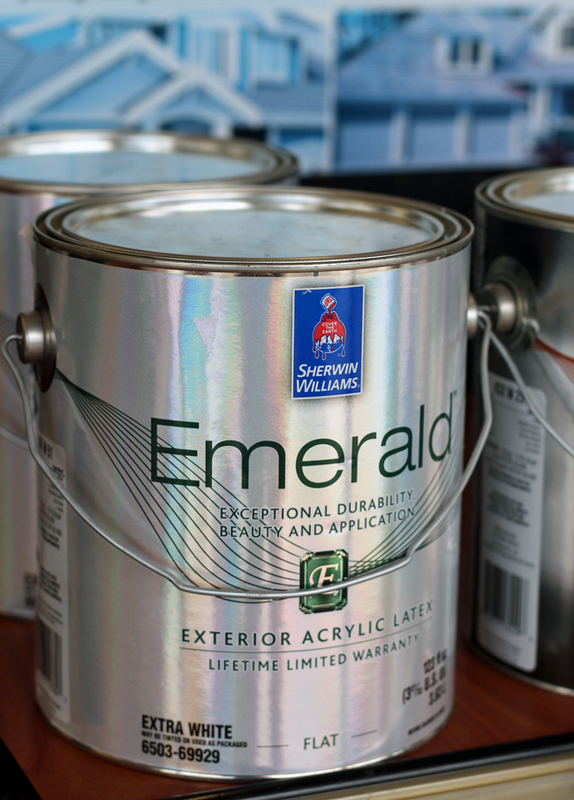 I chose to use Sherwin-Williams Emerald Exterior Acrylic Latex Paint in Pure White SW 7005 . I simply washed the walls down with a hose and once dry, rolled the paint on with a very thick high nap roller. That way it would get into most of the nooks and crannies of those pitted blocks. As I waited for some additional holes and patches to dry on the rest of the walls I decided to focus my attention to the floors. I cleaned them thoroughly with H&C Concreteready Cleaner Degreaser and then followed up with H&C Concreteready Phosphoric Etching Solution (all available at Sherwin-Williams!) that prepared the floor for the new stain. This floor never knew what was coming! I knew that I wanted something graphic on the floor to pull focus from the walls. When brainstorming with my clients I suggested the pattern I did on their closet doors last year. 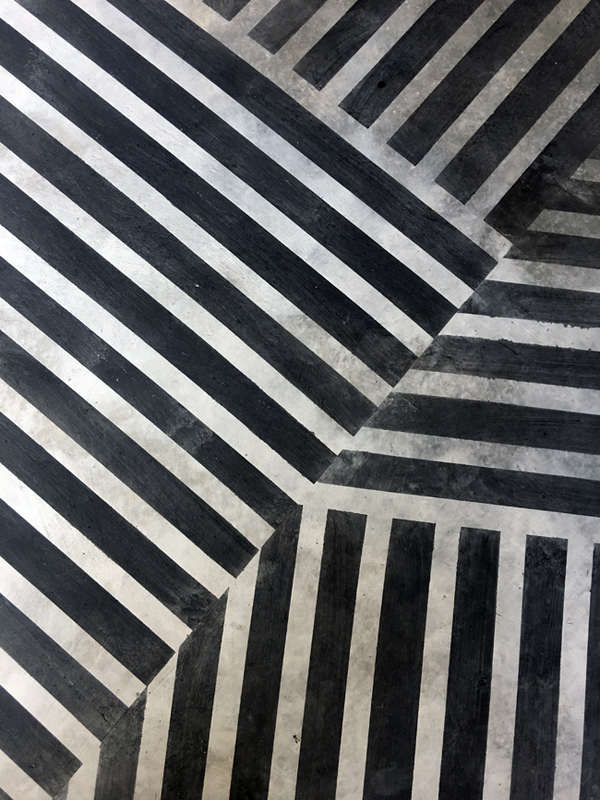 The haphazard stripes would be a great solution for this concrete floor as none of the walls are perfectly straight and the floor itself was not necessarily perfectly flat either. Any other pattern might draw attention to those two flaws, this one would be a bit more of an illusion. I began to tape. And tape. And tape some more. I worked on half the room at a time, allowing me to walk around on the untouched portion while I strategically placed the tape. Once half of the design was laid out, I began to stain. I used a Semi Transparent Stain in the color Obsidian. I did not want a solid color as I was embracing the flaws of this space and working with them not against them. The semi transparent nature allowed some of the original rust stains show through, a look I was hoping to achieve to pay homage to its previous life. I rubbed the stain on with a glove and a rag. And cotinued until all of my tape lines were filled. The stain was dry almost immediately, as the concrete absorbed the color instantly. But I let it sit over night and returned for the other half of the room the next day. Again, I taped. And taped. 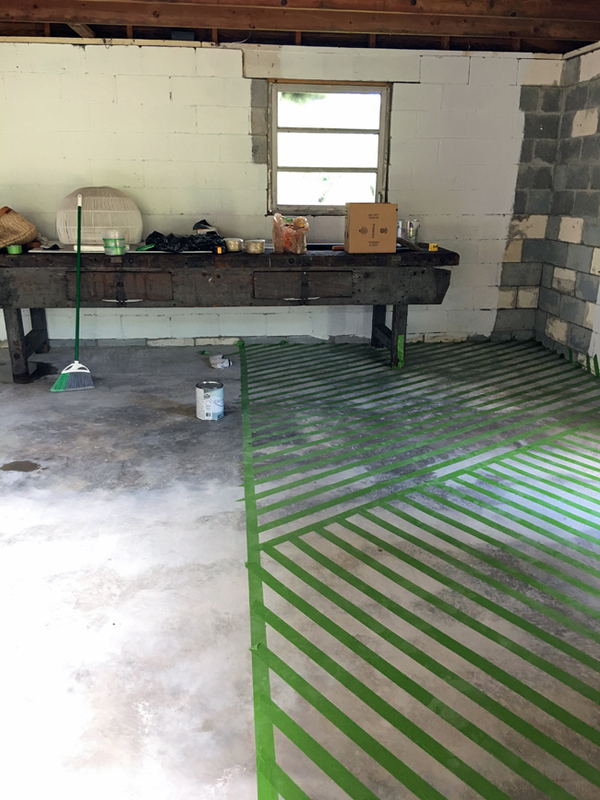 And taped some more… then stained the rest of the floor. Once all of the tape came up, I knew that all of the hard work that had gone into this dark and utilitarian space was going to pay off. After allowing the floor to dry another day, I sealed the floor with H&C Infusion Solvent Based Decorative Concrete Sealer in High Gloss and finished painting and touching up my walls. The Party Shack was finally coming to life. What a difference right?!! 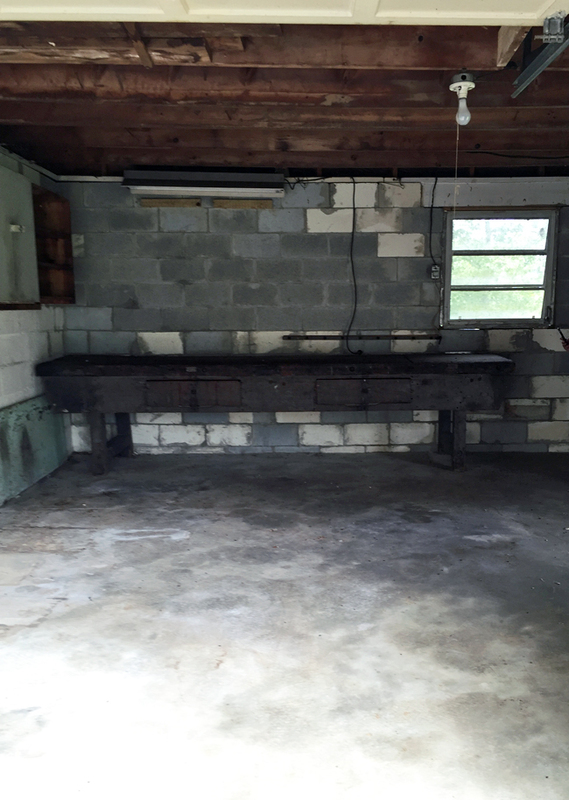 We kept the giant work bench untouched in all of its primitive beauty and decided to build the room around it. After all, it is still a great place to tackle a project, or act as a buffet for the big game. But I loved the juxtaposition of the glossy graphic floor with the roughness of the table and the Pure White paint color that completely transformed these dingy, old walls. By painting the mismatched blocks all the same light color, the flaws all seem to fade away. 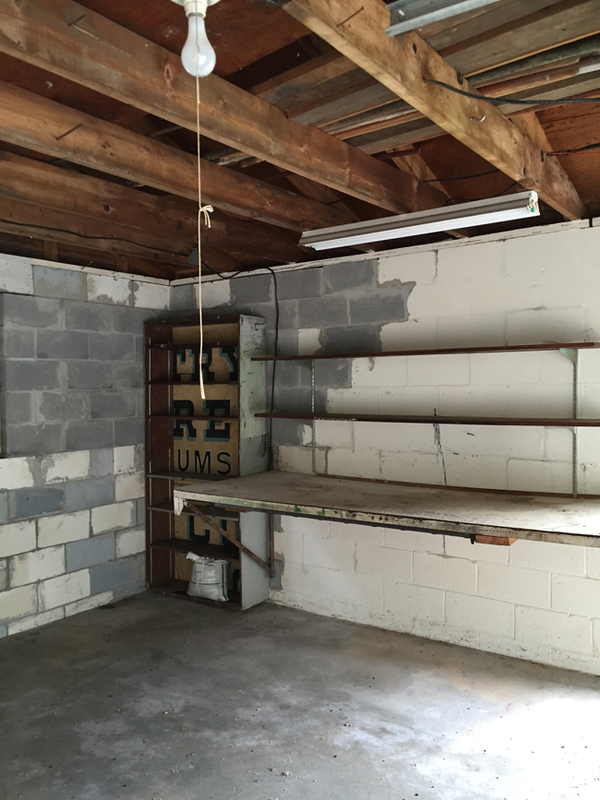 And since we kept the large workbench, the second work bench that once graced this side wall was no longer needed. 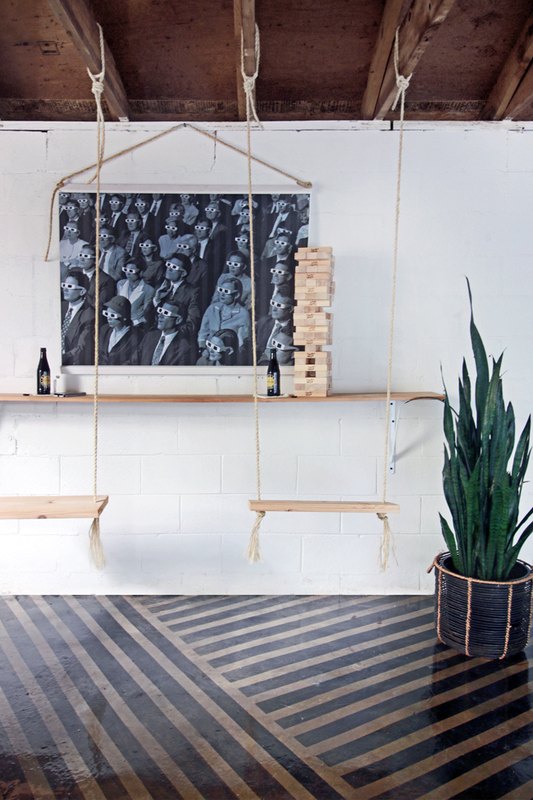 Instead a simple wood ledge and some simple wooden rope swings act as a fun place to sit and have a drink. The playfulness of the swings hanging from the rafters really reinforces the whole idea of the Party Shack, I think. I’ll be sharing more about the furniture within this space in the next few days, but I just had to share that no matter how daunting a project might appear a little creativity, some hard work and some paint can really transform a space into something amazing! To see the entire furnished and finished space, click here. This is amazing! Love everything you did here! Question, how did you clean ththe rafters? Did you have to seal them at all? Thank you !! We didn’t really touch the rafters much at all. I figured they have lasted so well for the past however many years, that they could remain untouched. The new paint really made them stand out. Thanks for sharing. I may steal your swing idea! This is exactly my workshop and our home is a 4 bedroom but with a tiny living room. We are a family of five and I really am not ready to move. We need more space for kids and art projects. This is our answer! My husband is even on board! Yay! Yay!!! It really does add to your living space. Good luck! Wow, that is some awesome transformation. LOVE the floors. I love the floors!! Is the floor slick if feet are wet? Any glossier surface will be a little slick when wet. As this isn’t an issue for this space we went for it. I would recommend a matte finish for any area where water may be an issue. How did you keep the spacing in between the lines even? I’m very impressed. Don’t look too close, they aren’t even. I eyeballed the entire pattern and my eight year old even helped me put down the tape. I want a party shack! This looks awesome! This space turned out AMAZING!!! Bravo for seeing the diamond in the rough. What a fun space to hang out in. So fun! 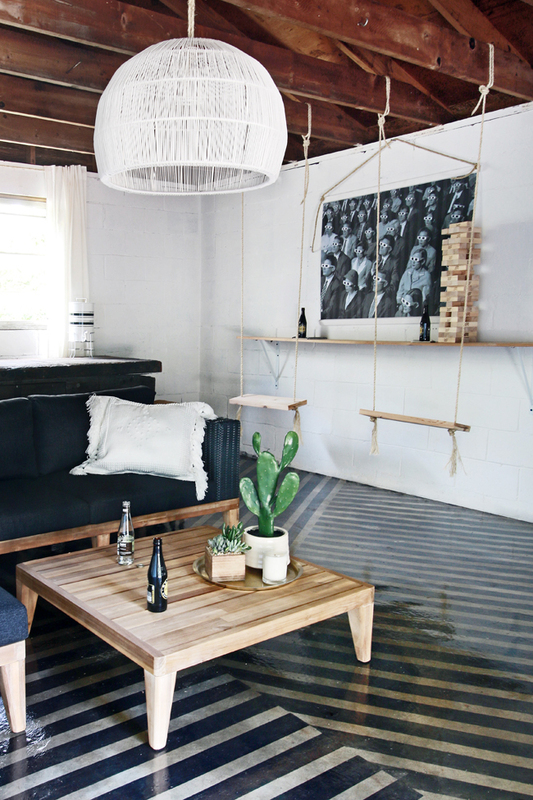 I adore the swings in this space and that floor came out amazing! Looks great! Where is the print from? I bow down to you! Those floors!!!!!!! I am about to do a chic shed…very french and shabby polished. Its in my new barn…so brand new concrete floors. What do you suggest for new concrete? I am thinking a solid stain, then painting with a stencil ot taping and using a graining tool. Does there need to be a primer under the stain? No primer needed for stain. Just make sure your new concrete has not already been sealed. This will prevent the stain from absorbing into the concrete. 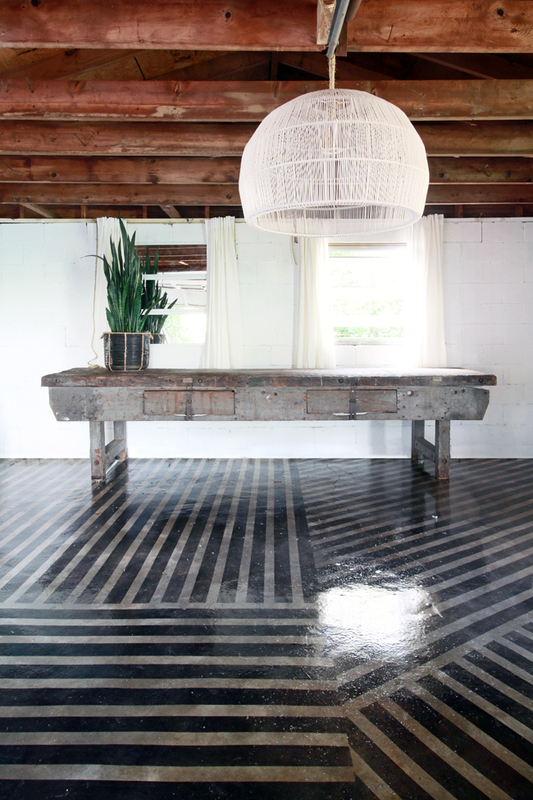 I will say that I have both stained and painted concrete floors and the stain is the option I recommend. 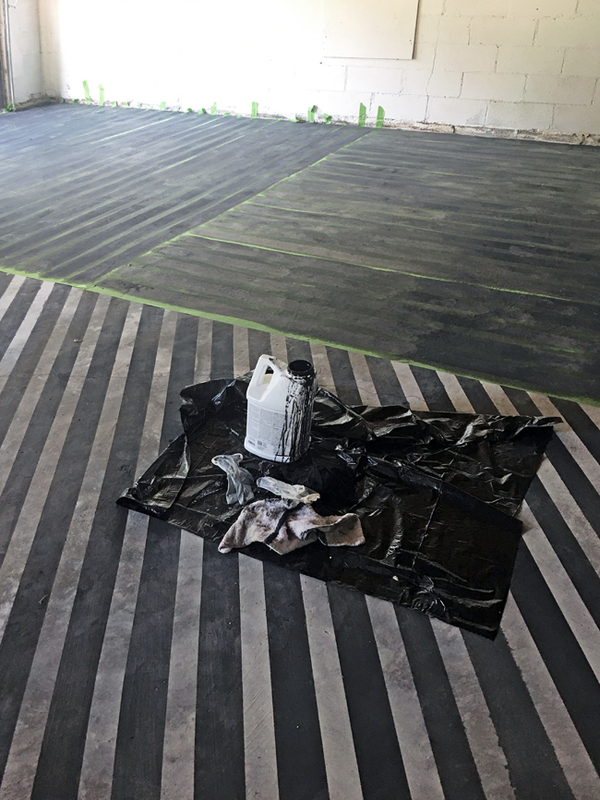 Stain absorbs into the concrete making it more durable… the paint will mostly sit on top. Even after being sealed it can begin to chip and peel away. Best of luck with your project!! The kids will wreak havoc with the swings otherwise nice work, impressive appearance. I think the floor is pure genius!!! I may try this in a basement to make a man cave for my nephew! So to be clear, you just used the Sherwin Williams products to prep the floor? Nothing else? I noticed in the original picture, the area around the windows was not finished. Did you add trim to the windows? I couldn’t tell because of the curtains. You did an amazing job! It looks fantastic!!! Thank you! Yes, I only used these Sherwin-Williams products to prep the floor. The owners are planning on replacing the non efficient windows down the line, so we did not touch the windows at this time. 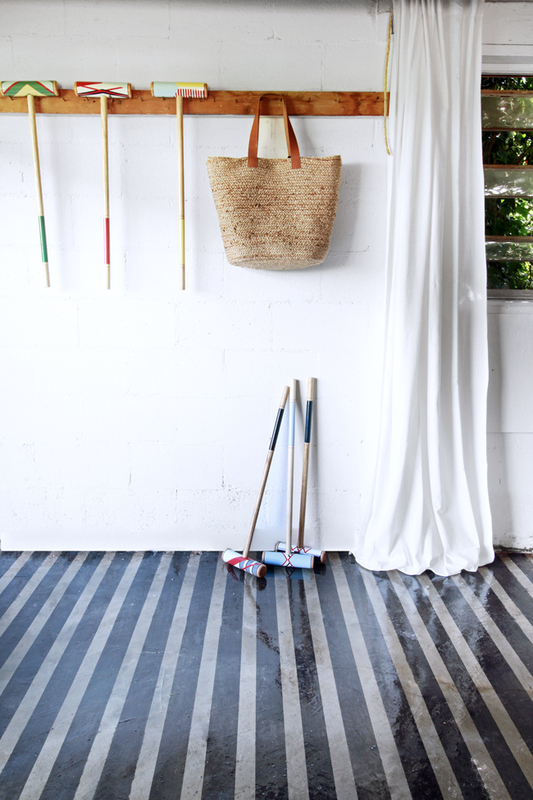 Will the stain hold up well if you are using the garage to park you car and store your stuff? Thinking about using an epoxy. Any recommendations? I don’t see why not. The stain does absorb into the concrete if prepared properly and once sealed should be fine. Is it possible to do this in a garage working as a “garage”? I mean, will the color of the floors and the high gloss sealer resist the hot tires of the cars runing on them? I would think that the stain would be fine in a working garage. I would suggest that you ask someone at your local Sherwin-Williams regarding the top coat. 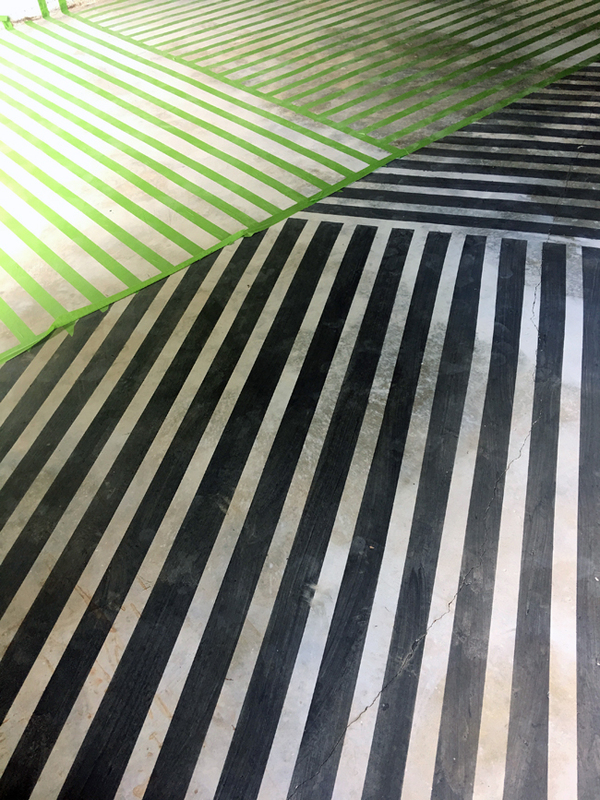 They would be able to provide you the best product for a “functioning garage” floor. We are moving into my husband’s grandparents small home with an unfinished basement…with money needing to be utilized elsewhere in the home for other updates, I am THRILLED that I can try and use a stain and ‘draw’ a rug on the floor where the college kids will be hanging out…THANK you for sharing this design. I’ll be the one at Sherwin Williams this weekend!!! Love this! Thanks for the inspiration. I’m turning my garage into a studio.